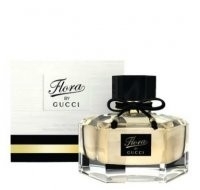 Flora by Gucci is an original, feminine fragrance is faithfully rooted in the Italian fashion house's glamorous past, yet exudes a brightness and modernity that is distinctly of the moment. Utterly feminine, yet deeply sensual, Flora by Gucci is characterized by contrasts. The core of this fragrance is composed of both rose and osmanthus flower, a rare and delicate bloom originating in China. Fresh citrus and peony are used as a top note, which impart a sensual youthfulness. These sweeter notes are reigned in by a powerful base composed of sandalwood and patchouli, signatures of the Gucci fragrance world. This scent is lovely,really floral and sweet but also really feminine. It is not overpowering and stays smelling great for a while. The bottle looks great too really girlie and feminine. The price however is a little steep and would have to be an absolute favourite to pay the full price. ... but this fades quickly. The opening florals are strong but not great and the fragrance doesn't have gteat projection or longevity. Overly sweet and not worth the money. "This scent is lovely,really floral and sweet but also really feminine. It is not overpowering and stays smelling great for a while. The bottle looks..."